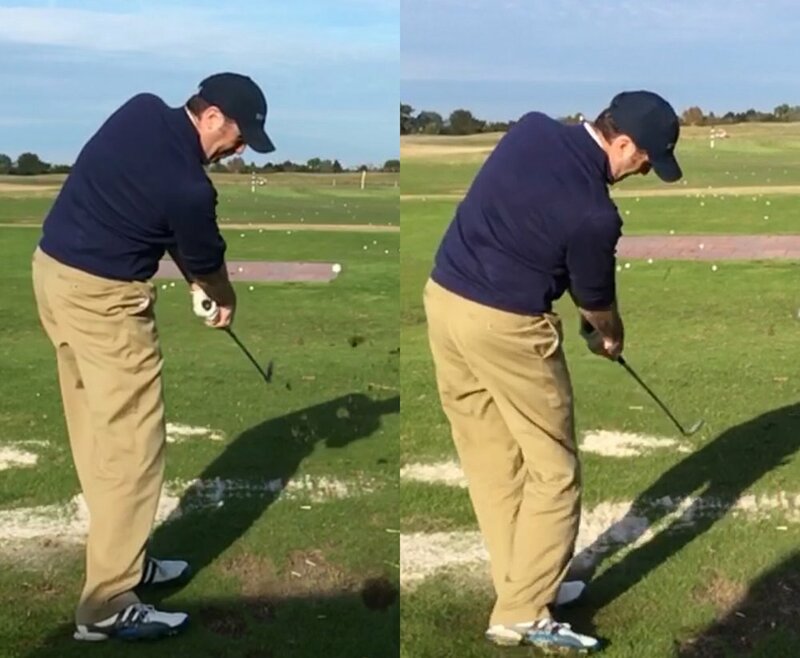 Feel the hips working more up and down vs level - Sam Snead image. This would serve to improve body motion and discourage the arms from working behind her too much. Consciously keep her arms more in front of her. A drill was to make back swings while backed up against a wall. This would keep her arms from getting deep and allow them to work in front of her on the way down. Sense the hands tracking left of the target through impact. She has worked on the dispersion drill in the past and has had good success with it. Hand path is often over looked and is an important part of what I teach on a daily basis. Thanks for watching! This free website's biggest source of support is when you decide to book a lesson or golf school. You can contact me HERE. If you live in another state or country please consider making a purchase HERE or HERE. It will help your game in addition to helping me to keep adding to this free website. Thanks again for your support! Andrew. For most golfers this is a biggie! If they can manage to get the shaft to shallow or flatten in the early stages of the downswing their chances of drawing the ball, along with a consistently crisp strike are greatly improved. A flat lead wrist at the top of the backswing. If you can shoot in the 60's this is not imperative, but it will make the job of flattening the lead wrist in transition and the downswing that much easier. Get the shaft either straight or laid-off at the top of the backswing. Where you point the handle ultimately determines where the shaft is angled and it's much easier to manage it this way. Allow the hands to travel out or in front of you slightly as you start down. Be careful you don't over do this, but there are few things worse than getting the hands tucked in behind you in the downswing. In the above image Tiger displays a flat left wrist and a slightly laid-off shaft, Trevino has shallowed the shaft and has a flat lead wrist, Carl Pettersson really gets his hands to travel out at the start of the downswing and Snead follows suit. All positive swing elements to emulate. I would recommend you start your quest to improve this important swing factor in front of a mirror. Get a feel for each of the three keys by watching them and "seeing" what they need to feel like and then you'll be free to head out to the practice ground. I am so excited to get the word out about this coaching event! For professional coaches and teachers only, Coach Camp 2016 will take place at Berkeley Hall in Bluffton, South Carolina on February 22 and 23, 2016. This will be two days of industry leading coaching information designed to positively enhance the course of your career. The event is being sponsored by True Spec Golf, an innovative custom club-fitting operation that all golf coaches should know about and SwingCatalyst, the premier balance plate and 3D motion plate company in the game today. Each presenter will be given an opportunity to discuss a topic of their choosing and there will be "panel" style discussions on wedges, driving, how to grow your business and even a lesson where each featured coach will share their thoughts on improving the same golfer. Something different and interesting! Dinner on the 22nd is going to be special as Dr. Morris Pickens will share a few of his experiences being with Zach Johnson at the Open Championship at St. Andrews earlier this year. Please be aware that this event is only open to 55 participants. For full details or if you'd like to register go to www.CoachCamp2016.com. I'm so looking forward to it and I sincerely hope you can attend! We would all like to drive the ball longer off the tee, yet far too often golfers search in all the wrong places to find more distance. There are three primary factors that will help you hit the ball further: a well fitted golf club; a stronger, more flexible and ultimately faster you; and a swing that delivers the clubhead to the ball in a manner that maximizes the force you are putting into the swing - what I like to call efficiency. Where you get out what you put in. Here's a great example - on the PGATour David Toms swings at 104 mph and Stephen Gangluff swings at 120 mph, yet they average the exact same distance off the tee....hmmm? Efficiency is the big fish and the area where most golfers can make the greatest gains. With this in mind I created (with the help of TrackMan) a chart that I like to use to show golfers how far they are capable of hitting the golf ball with their current club speed. The chart ranges from swing speeds of 65 mph to 105 mph and assumes no wind, flat terrain, normal ground conditions, sea level and premium type golf balls. These distances can only be attained with an upward attack angle (+5 degrees) and fairly low spin rates - somewhere between 1900 - 2200 rpm. Keep in mind that the above numbers are achievable, but only in a 'best shot' type scenario. David Toms was the most efficient driver on the PGATour in 2012 and at 100 mph he would have averaged 278 yards per drive - very good for an average. Regardless of what our swing speed is we are all capable of this highly efficient delivery of energy from club to ball. How helpful can this chart be to you? If you're a golf coach with TrackMan technology you can benefit from it immediately. As a golfer you would need to have a rough idea of what your club speed is followed by an honest assessment of how far your ball is travelling in neutral conditions. If you're noticeably shorter than you should be, seek out the nearest golf coach with a TrackMan and get to work. You may have heard the term high launch, low spin....well, it really is what you should be after off the tee box. Using TrackMan my idea was to test the same golfer, clubhead and golf ball, but change the shaft length. I took my current driver, which is the Titleist D3 8.5 degree (B1) with a 45" Motore F3 70 gram stiff shaft and tested it alongside the same head (B1) with a 43" Project X 82 gram stiff shaft. Essentially a driver shaft versus a 3 wood shaft. I had recently came across a 42.5" well kept old Wilson Staff JP persimmon driver with a steel shaft and decided to include that in the testing. I hit 11 shots with each club and eliminated the data for the poorest shot with each club. I was using fresh Titleist NXT Tour golf balls and it was a perfect 80 degree day with little wind. The results were astounding! By the way - most of the above quotes are from full-time professional golf instructors. So what can we learn from this research? Having tested a few golfers with shorter shafts it seems to me that each golfer has a 'threshold' length - an ideal length that gives them the optimal combination of speed and accuracy. For some that threshold could be 46" while for others they perform best with a 42" driver. The only way to find out is to get yourself with a teacher or fitter that has access to Trackman and various shafts. Another point to note is that while the 3 wood shaft had a slightly slower club and ball speed the shots were longer...why? Notice how the launch angle was higher while the spin rate was lower. A perfect illustration of the term 'high launch low spin'. 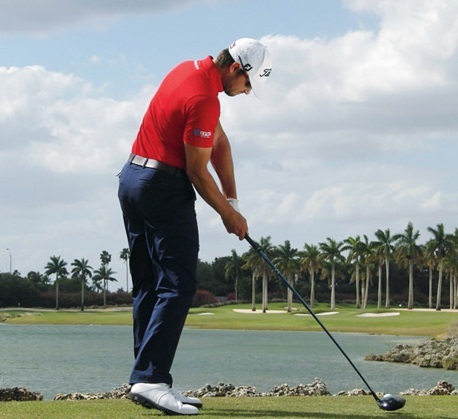 Launch the ball higher to get more out of your tee shots. What can we learn from the 'persimmon' data? While that shaft was even shorter than the 3 wood shaft it was substantially heavier. I believe the 3 wood graphite shaft was almost 50 grams lighter than it's steel counterpart which would explain the almost 7 mph difference in club speed. The size, or lack there of, of the head was intimidating in the beginning, but as I went through the shots I became more comfortable. I believe that practicing with a smaller clubhead like this can only be beneficial in the long term for any serious golfer. My feeling standing over the shorter club was better and almost every golfer I tested reported the same sense. The club feels easier to control and many golfers have reported a feel that they can 'get through' the shot better. I really felt like I could smash it without it going off line - a nice feeling! Physics says that longer shaft + lighter shaft = faster club speed = more distance. On paper that might be true, but when the human element is involved everything changes. The next time I tee it up it will be with a substantially shorter shaft in my driver...but that's just me! Times have changed! TrackMan has shown me that far more golfers hit down too much than those who don't hit down enough. The "hit down" mantra has been flogged to death. This video I filmed in conjunction with Revolution Golf will give you some idea as to what to look for as you work towards an improved and shallower strike on the ball. As Martin Chuck so aptly said in this very good follow up video, "We're looking for bacon strips, not pork chops!" A shallow strike will improve the crispness of your strike - give it a try. In today's fast paced world there isn't enough time to play golf, never mind work in a proper warm-up before you play. With the help of Berkeley Hall's TPI Certified trainer, Derek Lemire, this article isolates a few important exercises you can sneak in before the round to help you better prepare to play some great golf. I would encourage you to select two from each body zone and work towards incorporating them into either your daily routine or at the very least do them before going out to play. Remember this - if you keep doing what you've always done, you'll continue to be the golfer you've always been! Accept the challenge and commit to the change. I hope you enjoyed this and are keen to get out there and try a few of the suggested ideas and drills to see if you can improve off the tee. The particular shot we're looking at was struck well off the heel (yellow circle) and essentially what happened was the draw bias of the swing pattern was cancelled out by the fade bias of the strike point. Notice how in the second yellow box above there's a closed face to path relationship, which should lead to a hook, but the ball flew straight - always a dead give away for a heel strike. When you're practicing driver you should always mark the face with some Dr. Scholl's Odor X foot spray. If you do that you will always get B (strike point) and C (ball flight) from any shot. Should you be practicing without a TrackMan you'll at least have a clear idea as to what your swing pattern is and can make well-informed adjustments if necessary. This is a drill to do at home or in the gym and translates the feeling of impact nicely. Be sure to only drive the hips to compress the physio ball and not the entire body. Do this drill on a regular basis and you will really start to gain a sense for what the downswing should feel like. This drill conveys the feel for what the hands and arms need to be doing as they approach impact. It can easily be done indoors and is something that every golfer could benefit from. Be sure to start this drill with some crease in the right elbow and right wrist if you are a right hander. If you are hunkered down indoors yet still feel the need to work on your game these drills will go a long way towards preparing you for when the season rolls around. Please view all the above drills and others on my Youtube channel. Just enter andrewricegolf to see them all. 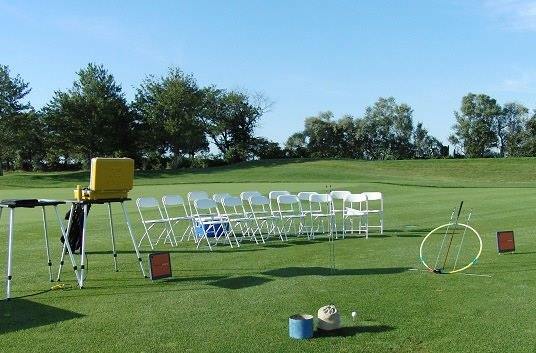 Great Offers for Wedge and TrackMan Group Sessions starting at $75 in the New Year too! The member lesson rate is $120 per hour and the non-member lesson rate is $175 per hour. Payments can be made via PayPal. Please contact arice(at)berkeleyhallclub.com for further details. I am also very excited to release what is the culmination of almost three years of research and testing . The Wedge Project is an in depth video that explains what is important to being able to hit consistently crisp, zippy wedge shots. Please trust me on this one - I know I have been promising this video for some time now - it will be worth the wait and every penny you spend on it! I anticipate the cost to be in the $14 range and it will be available via download from my website. The video will be somewhere between 30 and 45 minutes in length and will include numerous drills and a clear explanation of what really is important when you have a wedge in your hand. Please be patient with the release of this video as I would much the final product be a little late and great than early and mediocre. I know you're going to love it, simply because what I share WORKS! I am looking forward to an exciting 2014 as I spend my first full year at Berkeley Hall in a long time. I hope we can all get to spend some time together on the lesson tee or online in the upcoming year. Thank you for everything!